Bianca: Enigma is so clever – and of course the illustrations are amazing – can you tell us how you came up with the idea for this great picture book? Graeme: Ever since I made The Eleventh Hour 20 years ago, with its sealed section at the back, I’ve been fascinated with the idea of creating a resealable version of the sealed section: a relockable safe. My final success with a design of this system spurred me on to write another mystery story. My recollection of my son James watching magic tricks performed by his Grandpa inspired the story itself. It was a very precious memory. Bianca: Is there a typical process you take to complete each book? Graeme: Each book takes two years to make, usually after the concept has been spinning around in my mind for a few years (sometimes longer). The first third of that time is generally spent writing and designing, the next two thirds executing the final artwork. Bianca: As someone who grew up wanting to be an artist, when did you first consider yourself a writer? Bianca: Is your studio in Australia your favorite place to work? And how many hours a day do you spend working? Graeme: My studio is upstairs at my house. Working from home is one of the best parts of my job. The amount of time I spend there is directly related to the proximity of the deadline, though I find I do more often than not and that I need to discipline myself to stop work rather than start. There is always so much to do. Bianca: Do you have any interesting illustrating and/or writing quirks? Graeme: Although I did a Graphic Design course, I’m pretty much self taught as far as my technique goes. It is a bit weird in that I work on one section of the page at a time, taking it to a high level of finish before I move on to the next white space. My wife Robyn, who is a classically trained oil-painter, is always amazed that the pictures manage to hang together in the end! Bianca: What do your children think of your books? Graeme: My children have a very healthy disregard for me and my work. They see it all around them all the time so they take it for granted. And I never read them my own books when they were young – it just felt weird! So their friends probably knew my books better than they did. Just the other day my 15 year old daughter was home sick from school and read a stack of my picture books – some she had never once read before! Bianca: Which books from your childhood left the biggest impact on you? Did they inspire any of your work? Graeme: The Lord of the Rings by J.R.R.Tolkein was undoubtedly the biggest literary event of my young life, followed closely by Mervyn Peake’s Gormenghast trilogy. And the Hobbit of course. Bianca: Australian to Australian … will you ever do an all Aussie book? 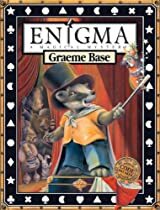 Graeme: The very first book I did, My Grandma Lived in Gooligulch was all about Australian animals, so I reckon I’ve got that one covered! Bianca: Is it true you are selling all of your original artwork from your books? Graeme: Yep. Three contacts: ‘Every Picture Tells A Story’ in Santa Monica. ‘Melbourne Art Rooms (MARS)’ in Australia and ‘The Official Graeme Base Art Website’ (or something like that as I recall) on the net. Bianca: What can you tell us about the ‘snail’ project you are currently working on? Graeme: It’s a piratey kind of thing – an ocean-going adventure anyway – with a lot of unusual creatures including (as you suggest) a snail. All else remains to be seen! Bianca: If you were stuck on an island and could take only one book, what would it be, and why? Graeme: James Joyce’s Ulysses. I have tried reading it three times and failed each time. It I so dense and difficult. But it is supposed to be one of, if not the greatest literary works ever created and I am determined not to be beaten. I’m hacking through it again now as I tour US. Bianca: Any final words of wisdom from the Great Graeme Base? Graeme: Only if you promise never to call me that again. To steal a favourite quote on the secret of success from John Paul Getty: Rise early. Work hard. Strike oil. Bianca: While I can’t promise not to refer to you as great, because your work really is, I will never ever call you the Great Graeme Base – at least not to you directly!! Links: A Graeme Base podcast by Roller Coaster at www.abc.net.au.